Saint Joseph Rehabilitation and Nursing Center is committed to providing an exceptional level of service to our residents and their families. We offer 24-hour skilled nursing care for those who require long-term care or sub-acute services. As a skilled nursing facility, we are able to provide a wide range of services including: IV therapies, G-tube management and enteral feedings, wound treatments and prevention, post surgical care as well as stroke rehabilitation. Upon admission, each resident receives a comprehensive assessment to determine their individual needs. Our multidisciplinary team which includes Physicians, nurse practitioner, licensed nurses, therapists, social workers and dietitians will then develop a specialized care plan to help that resident regain their optimal level of functioning and health while remaining in our supportive environment. Saint Joseph offers specialized clinical pathways, including wound care, cardiac, and orthopedics. These pathways ensure that patients receive tailored pharmaceutical, medical, and exercise programs to improve quality of life, mobility, and overall health. Orthopedics: A local orthopedic surgeon has created and implemented state-of-the-art rehabilitative and exercise programs at Saint Joseph for patients recovering from joint replacements. This orthopedic pathway allows for rapid recovery and maximum range of motion. Saint Joseph also offers a unique short-term solution for many families who provide full-time care for a family member. Our Respite Care program allows caregiver family members to take vacations or take care of matters that require extended time. During their stay, respite guests are made to feel welcomed in our warm and comfortable environment and receive all the services and amenities that our inpatient or long-term care residents enjoy. We know that this is a difficult time for patients and their loved ones, so we offer additional support through hospice care through our third party providers. We support our residents and their rights to make decisions about their care. The enhanced physical, emotional and spiritual support, comfort those that are suffering from illness. If a resident should need end-of-life care while at Saint Joseph's, you can be assured that, if requested, our staff will work with residents and family to set up an environment that promotes quality of life with respect and dignity. Saint Joseph's will provide professionals and volunteers to help residents end-of-life choices as well as direct care and support for the patient and family. Whether you are here as a short-term sub-acute patient or a long term care resident, Saint Joseph Rehabilitation and Nursing Center provides a full range of clinical services that will assist you with achieving your maximum level of function. 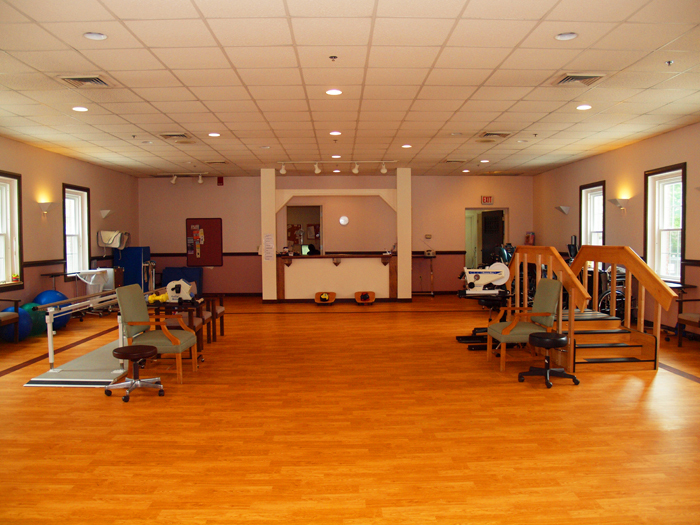 Saint Joseph Rehabilitation and Nursing Center offers diverse team of therapists and doctors who offer our residents some of the most progressive physical therapy, occupational therapy and speech therapy programs in the area. Our modern program features a dedicated clinical team of therapy professionals along with our state-of-the-art Rehabilitation Department. Our team uses advanced techniques and equipment which improves patient outcomes resulting in earlier discharges to home. All of the rehabilitation programs we offer are carefully designed to assist patients in regaining their optimal functionality and independence. Our occupational therapists focus on balance and upper body strengthening - necessary skills for daily living. Our physical therapists focus on lower body strengthening, gait training, transfer abilities, and assistive device usage. Speech therapists focus on managing swallowing deficits, developing problem solving abilities, and improving speech and language skills. Together, our goal is to provide each resident with the opportunity to overcome barriers and re-master lost functional skills due to limitations caused by illness or age. We also have an outstanding orthopedic program which assists patients with a variety of trauma-type injuries, degenerative arthritis, joint replacement and orthopedic fractures. Our therapists are experts in the care of musculoskeletal conditions in adults and are committed to caring or the total patient. At Saint Joseph we believe in addressing patients' individual needs through a comprehensive evaluation and treatment care plan which is designed to help get them back to a full active lifestyle as quickly and safely possible.